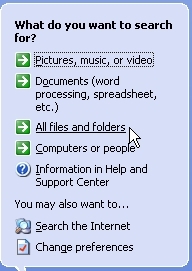 This page outlines instructions on how to use the Windows XP Search capability. You can use these steps with Win 98 or Vista as well as MacOSx with some modifications. 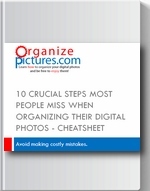 The key to finding your pictures is to have named your folders in a consistent way according to the steps outlined in the Organize pictures booklet. STEP 1: Start the Search Utility. Start --> Search --> For Files or Folders. If you have named your folders with enough details you should be able to locate them very quickly using the Search capability that Windows includes by default. You don’t need any special program to install or learn, you use only what comes with Windows on your PC. 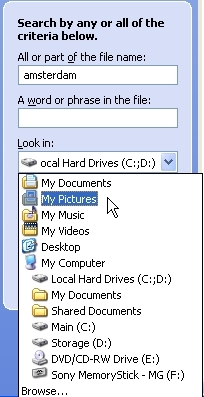 STEP 2: Click All Files and Folders on the Search Utility screen. You may wonder: Why not use the Pictures, Music or Video? This option will find specific files and not folders. We usually want to find the folders containing the pictures we want, so we need to search for folders. Make sure you’re searching for all files and folders. STEP 3: Enter parameters for searching. Make sure you select My Pictures (or your pictures folder) in the “Look in” field. Otherwise it will search your entire computer. In the “All or part of the file name” field enter the event or place you’re looking for. If you have named your picture folders properly you should be able to find them quickly. Enter something like: bday, birthday, grandma, yosemite, or other events or places of interest. You can also enter part of a word (i.e. 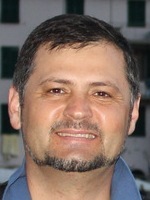 grand, yose, birth, and day) and the search utility will find what you’re looking for. Modify the parameters for your search.